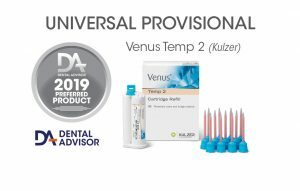 Venus Temp 2 is intended for the fabrication of short- and long-term temporary crowns, bridges, inlays, onlays and veneers. The material is a self-cured, fluoride-releasing provisional restorative material comprised of multifunctional methacrylic esters. It is available in five shades (A1, A2, A3.5, B1, and Bleach) and is packaged in a 50 mL auto-mix cartridge. Venus Temp 2 features a working time of 50 seconds and a setting time in the mouth of 1-2 minutes. Six minutes after application, the oxygen-inhibited layer can be removed with alcohol and the restoration may be trimmed and polished. Each refill package contains one cartridge of Venus Temp 2 and 12 mixing tips. Venus Temp 2 was evaluated by 32 consultants in 665 uses. 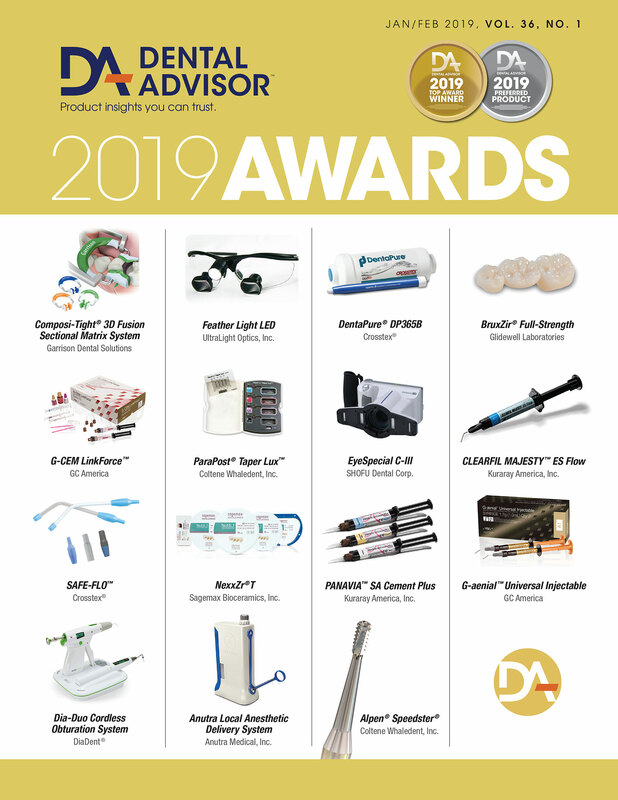 This product received a 90% clinical rating. Venus Temp 2 is a strong provisional material that trims nicely without chipping. Consultants used Venus Temp 2 successfully for long-span bridges and other multi-unit cases. The esthetics is very good, and due to its nano-particle formula, the material can be polished to a high luster. Working and intraoral setting times rated highly; however, consultants would like to be able to trim the provisional earlier than six minutes. Venus Temp 2 has a very low oxygen-inhibited layer that aids in handling and polishing. Ninety-one percent of consultants rated Venus Temp 2 either equivalent or better than their current provisional material. Seventy-two percent would switch to Venus Temp 2 and 84% would recommend it. Material sets hard – avoid use in undercuts.